It can’t get any amusing than this! A mobile phone that can put out 100 decibel ring tone which is as loud as a vuvuzela has been introduced for the hard-to-hear elderly in UK. The Vuvuzela hit head lines during the world cup soccer games this year. The Amplicom M6000 carries the distracting ring tone and there is little doubt that you will not notice it. The phone is pretty “elderly friendly” with large, clear buttons and very few complicated features. Some of the elderly who had tried out the phone said that the ring tone was extremely loud but comfortably mild for a hard-to-hear elderly. The phone is said to be popular amongst those who feel that the present smart phones have unnecessary functions which they might seldom use. The standard earpiece volume of the M6000 goes up to 30 decibel and with a boost function enables it to be increased right up to 110 decibel which realisticly is louder than a motorbike or the average thunderclap and is as noisy as being at a rock concert. 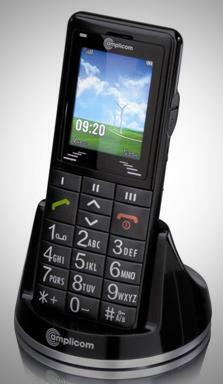 The phone has no camera but has an SOS button on the back which can be set to ring a relative in an emergency. One interesting feature is the motion sensor which can dial 911 or any emergency contact if the user falls over. Well everything turns me on about this phone except the vuvuzela! Previous Kitchen sized Food Factory Cuts, Cooks, Mixes and Everything else!